We’ve learned quite a bit about Earth’s moon since the first Apollo landing, but we’re still not sure how it formed. But we’re a step or two closer to solving that puzzle. A team of scientists think Earth and its moon got started as a synestia. It’s a new word for a new twist on the collision model. Some other scientists think they maybe on the right track. Others aren’t so sure. Many apparently think the synestia model deserves a closer look. Figuring out how Earth’s moon formed wasn’t a problem for Aristotle. Even if he thought our moon was more like Earth than the rest of the universe, he’d have said it had always been here. Matter, as he explained in Book I of “Physics,” was eternal. Given the data he had, his cosmology made sense. I gather that their problem was trying to understand how Genesis 1:1 and Aristotle’s assertion that this universe had always been here line up. His spheres and Mesopotamian cosmology not meshing wasn’t, apparently, so much of an issue. Copernican heliocentrism gave a whole bunch of folks fits a few centuries later. I see those conniptions as more political than academic, and that’s another topic. Time passed. Data from more precise observations backed up the basics of Copernican ideas, and showed that details of Copernican math didn’t quite match reality. Most folks, on all sides of Europe’s turf wars, got used to Copernicus being closer to the mark than Aristotle. Charles Darwin published “Origin of Species” in 1859, which doesn’t have much to do with physics or Earth’s moon. C. Darwin’s son is another matter. I’ve read, but not confirmed, that Édouard Roche published a fission hypotheses in 1873. I’ve also read that George Darwin came up with the idea. I figure someone had the fission idea first. Probably in the 19th century, maybe earlier. The fission models differed in details, but agreed that early Earth was spinning so fast that part of its crust got flung off, forming the moon. Someone said maybe the Pacific Ocean is the patch where part of Earth’s crust had been. That was in 1925, which helps explain why it showed up in one of my high school science textbooks. The fission hypothesis held on for decades. So did other ideas about our moon’s origin. George Darwin published his fission idea in 1898. Using Newtonian orbital mechanics, he figured our moon had started much closer to Earth and slowly moved outward. G. Darwin was right about that. Laser ranging, using reflectors left during Apollo and Lunokhod missions in the 1960s and 70s, fit both his and Einstein’s math. The other way around, actually. Darwin’s and Einstein’s math fit the new observations. Scientists don’t change reality with their equations. They just fine-tune our understanding of this universe. Scientists kept collecting and analyzing new data and publishing their results. Analysis of samples collected during Apollo missions helped, and added new puzzles. That, I think, is par for the course in science. G. Darwin’s fission explanation had at least one problem. He could trace our moon back to an orbit very close to Earth. But not to Earth’s surface. Even so, the math and logic matched observations better than many other ideas. The giant-impact model for our moon’s origin goes back at least to a 1946 paper by Harvard’s Reginald Aldworth Daly. He combined G. Darwin’s fission idea with the ‘capture’ model. That model has our moon starting out as a largish asteroid, getting caught by Earth’s gravity. It explained some things, like our moon being so big relative to Earth and having an orbit that’s closer to the ecliptic than to Earth’s equator. It didn’t explain others. Someone thought of the giant-impact model first, I don’t know who. Maybe it was Harvard’s Reginald Aldoworth Daly. He figured G. Darwin was basically right. Daly’s idea was that something about Mars-size hit Earth while the Solar System was young. The collision ended with a molten and vaporized mess, part which orbited Earth. That part became our moon. “In a new twist on the giant impact theory, a new idea posits that the Moon might have formed from the vaporized remains of Earth after an epic collision with another planet-sized body. “From all the time and effort humans have put into observing and studying the Moon, there is an awful lot we still don’t know about it, particularly when it comes to how it formed. I probably wouldn’t have said that this variation on the giant-impact theme “upends” the “Big Splat” idea. We’re still looking at something big hitting Earth not long after the Solar System formed. Not long in terms of geological or cosmic time, that is. What’s new is in the details. Until now, the giant-impact scenario was the planetary equivalent of a precision pool shot. The physics works well enough. But getting today’s Earth and moon is tricky. Whatever hit Earth had to come in at very close to a particular angle and speed. The odds of that happening are — not high. The long odds fit what we see in the Solar System. Earth is the only planet with a moon that’s such a big fraction of the planet’s size. Except for Pluto, but we didn’t know about Charon, Nyx, Hydra and the rest until recently. Charon was spotted in 1978, there’s been a lively debate over what we should call objects like Pluto, and that’s yet another topic. Older versions of the giant-impact idea worked better than G. Darwin’s fission model, but didn’t explain why Earth and our moon are so much alike, apart from the moon being short of volatile stuff. Lack of volatiles — stuff with a low boiling point, like nitrogen and water — isn’t the only difference between Earth and our moon, of course. The moon’s only about a quarter Earth’s diameter. Its magnetic field is tiny compared to Earth’s. Earlier giant-impact explanations for our moon’s origin accounted for those differences. But not Earth and Earth’s moon having nearly the same isotope ratios. Isotopes are elements with a non-standard neutron count. A copper isotope, for example, is still copper. It’s got the normal number of protons in its nucleus. What makes it an isotope is having a not-normal number of neutrons. Earth and Earth’s moon have nearly the same isotope ratios. That wouldn’t be odd if Earth and Earth’s moon started out as the same part of our star’s protoplanetary disk. Many scientists figure planets like Jupiter and Saturn had disks of dust and gas as they were forming. Those disks, scaled-down versions of our star’s protoplanetary disk, would have condensed into the Galilean moons. “Condensed” isn’t quite the right word, but I think you get the idea. If Earth had a — protolunar? — disk that became our moon, that’d explain both worlds having nearly the same isotope ratios. They’re made from the same batch of stuff. But if Earth’s moon formed after a planetary collision, its ratio should be more like the smaller planet’s, less like Earth’s. That’s what scientists learned when they started running simulations of the impact. The synestia model starts with an impact, and leaves Earth and moon with pretty much the same ratios. I don’t see it ‘upending’ the “Big Splat” idea. More like rethinking it — and coming up with something that’s still mostly “Splat,” with a bit of older fission ideas. It also may help explain why G. Darwin’s math wouldn’t quite bring our Moon back to Earth’s surface. I suspect it’ll be a while before I ‘hear’ “synestia” instead of “synestria” when reading it. And start spelling it correctly. It may take longer before I stop remembering Sinestro, former Green Lantern, when doing any of the above. And that’s yet again another topic. The earliest discussion of synestias I’ve found was Lock and Stewart’s 2017 paper. Their math, and the idea that Earth and Earth’s moon might have formed as parts of a synestia, is new. But not entirely. I’ve seen words and phrases like ‘radical,’ ‘crazy new’ and ‘debunk’ used in articles covering their synestia papers and responses to synestia models. I’m not obliged to follow editorial policies or journalistic conventions, so I’ll opt for less drama and focus more on what natural philosophers and scientists have been doing since the 18th century. Emanuel Swedenborg’s 1734 “Principia” said that maybe Earth formed in a nebula. Immanuel Kant read “Principia,” or maybe read about it. He gave Swedenborg’s nebula idea some thought, and came up with his own. Kant described how a gaseous cloud, a nebula, could be rotating, collapse and become a disk, eventually forming a star and planets. He published his ideas in 1755. Pierre-Simon Laplace published his nebular ideas in 1796. Apparently without knowing about what Swedenborg and Kant had written. Scientists and others kept discussing nebular hypotheses, and that brings me to the 19th century. James Clerk Maxwell said that planets couldn’t form from a rotating nebula, since the inner and outer parts would be spinning at different rates. Sir David Brewster said Laplace was wrong because Earth’s moon would have gotten all of Earth’s water and air. Thomas Chamberlin and Forest Moulton’s 1901 planetesimal theory, the James Jeans 1917 tidal model and Otto Schmidt 1944 accretion idea looked pretty good. So did William McCrea’s 1960 protoplanet theory and Michael Woolfson’s 1964 capture theory. “…So far, the synestia model has produced mixed reactions within the ranks of planetary scientists. Some of them welcome it as a potential fix for the limitations of the giant impact theory, but others remain skeptical. “‘Many of us would like a more natural scenario that makes it more or less inevitable that the Moon will have essentially the same isotopic composition as the Earth,’ said planetary scientist Jay Melosh during a recent conversation with Sky & Telescope. I’m not sure what Jay Melosh meant by “a more natural scenario.” Synestias don’t strike me as particularly supernatural, so he probably had something else in mind. Based on the rest of the quote, maybe Melosh would be more comfortable with a ‘Newtonian mechanics’ approach. I like Newton’s ‘clockwork universe’ determinism: the idea that if we had all data about the universe now, we could in principle, calculate everything that has happened and will happen. Maybe there’s a physical reality where physics works on strictly Newtonian principles. The one we’re in doesn’t work that way. Not if what we’ve been learning, particularly in the last century or so, is anywhere near accurate. Maybe Melosh had something entirely different in mind. That’s likely enough, since he apparently wants a scenario where isotopic ratios in Earth and Earth’s moon are “more or less inevitable.” On the other hand, that seems to be how the synestia scenario works. I think we’ve learned quite a bit about how planetary systems form, particularly considering that until recently we had only one example to study. I figure discussion, debate and reevaluation of synestias, accretion, and how Earth got its moon isn’t over. Not even close. Whatever happened in the early Solar System, the process left us with one rocky planet in the star’s habitable zone. And a huge rocky moon orbiting that planet. The Solar System’s rocky planets are the ones closest to the sun. Next, going outward from the star, there’s an asteroid belt and a series of larger planets. The outer planets are mostly gas and ice. It’s a nice, orderly arrangement: smallish, dense planets near the star; big, more-or-less fluffy ones out where it’s colder. Many scientists figured that other planetary systems, if they existed, would look like ours. Then we started charting other planetary systems. A few vaguely resemble the Solar System. Many don’t. 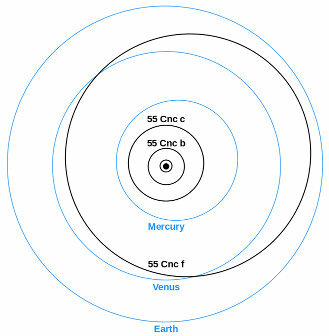 55 Cancri A about 41 light-years out, has at least five planets: Galileo, Brahe, Lipperhey, Janssen and Harriot. Janssen, the one closest to its star, is about twice as massive as Earth: the first super-Earth found around a main-sequence star. Its year lasts 0.7365 days, about 17 hours and 40 minutes. It’s very, very hot. 55 Cancri A’s other three inner worlds are almost certainly gas giants. Their orbits would fit inside Earth’s. Dimidium, 51 Pegasi b, is the first exoplanet of any sort found around a main-sequence star. It’s at least half as massive as Jupiter, in an orbit smaller than Mercury’s. We dubbed worlds like that hot Jupiters. We’ve been finding enough hot Jupiters, super-Earths and mini-Neptunes to start classifying these strange new worlds. And learning how they’re formed. We still haven’t found “Earth 2.0,” but a few planetary systems do look a little like home. Almost. The smallest of Kepler-11’s six known planets is about as massive as Earth, the biggest around Neptune’s heft. Like many we’ve found so far, the Kepler-11 system is more compact than ours. Maybe that’s typical, and we’re in one of the galaxy’s oddballs. Or maybe we simply haven’t found the more spacious systems yet. The Kepler-90 system has eight known planets. Some are around Earth’s size. Kepler-90h, the one in the system’s habitable zone, is a gas giant. It wouldn’t be habitable, but one of its moons might. Stars like TRAPPIST-1 are far more common than those resembling our sun. It’s a very cool red dwarf with seven known planets. Each one rocky, several in or near the star’s habitable zone. If the Kepler-11 and Kepler-90 systems are “compacts,” the TRAPPIST-1 system is a subcompact. 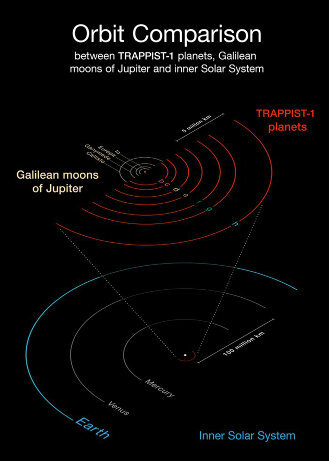 TRAPPPIST-1 is a near neighbor, on a cosmic scale: about 40 light-years away. I don’t know how long it will take us to send probes that far. I think we will, eventually. Not in my lifetime, probably not in yours. But I’d be astounded if we lose interest in this universe, and stop wondering what’s over the horizon. I certainly don’t know if any planets orbiting TRAPPIST-1 support life. Some scientists point out, correctly, that being the right size and temperature isn’t enough. Flares on red dwarfs are as powerful as our star’s. Earth-like planets would be getting enormous jolts of ultraviolet and other radiation with each flare. That wouldn’t be good for terrestrial life. On the other hand, scientists whose ancestors have been living on such a world might be discussing whether or not life could exist without those flares. That’s assuming that we’ve got neighbors who are a bit like us. I’ll be talking about life, the universe and neighbors in another post. Until a few decades ago, we didn’t know whether any stars besides our had planets. Some explanations for how the Solar System formed, like the nebular hypothesis, suggested that planets were common. Others made our Solar System seem highly unlikely: a statistical fluke in a vast and empty cosmos. I don’t think we’ll ever find a world exactly like Earth. But the ‘rare Earth’ debate has shifted to whether or not we’ll find life elsewhere. Planets are common as leaves on trees. Moons are almost certainly common too: at least moons orbiting gas giants, like those in our Solar System. We still don’t know how common or rare oversize moons like Earth’s are. I think finding a planet with a ‘too-big’ moon almost as soon as our instruments could detect such things is suggestive that near-doubles like Earth and Earth’s moon aren’t uncommon. I don’t see a point in trying to believe Orlando Ferguson’s imaginative variation on the Flat Earth theme. About God, the universe and attitudes, I’ll repeat what I say pretty often: I think God is right. I don’t think studying this universe threatens faith. That’s because I think God creates everything: and that we can learn more about God by studying what God makes. What we’ve been learning during the last few centuries didn’t fit what many assumed must be true. Some figured that since Mesopotamian astrologers had been wrong about how the universe looks, religion can’t be true. Given time and effort, we’ll see how truths we learn by studying this universe fit into truths we already knew. This entry was posted in discursive detours, science news and tagged exomoons, exoplanets, faith, getting a grip, physics, planets, science. Bookmark the permalink.